Amphora’s Diner Deluxe offers more than what might be expected from a typical diner. Think extensive menu running the gamut from eggs to Filet Mignon, in a comfortable and spacious setting, and with a focus on Greek dishes like moussaka, thanks to the owners’ heritage. But whether a guest’s tastes run to the ethnic, the high brow, or classic diner fare, they’re sure to find it here among the 300-plus menu items. 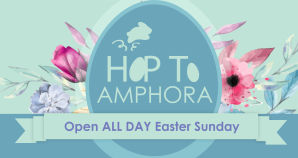 As one of the only 24-hour restaurants in Vienna, Amphora’s always draws a crowd. A favorite of locals and winning new fans every day.